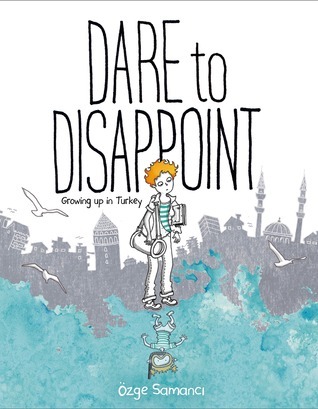 My son's English teacher sent this book to me when she found out that I grew up in Turkey. I immediately fell in love with this little book mostly because there's so much of my childhood in there. The author/artist grew up around the same time I did so a lot of the history she covers overlaps with mine and it was such a walk down memory lane for me. There were many parts where I chuckled out loud remembering so many little bits of my own story. Her story is very different than mine for a multitude of reasons, I grew up in Istanbul (to her Izmir) and have very different parents and I also am not Muslim. I went to different schools and left the country to attend college in the US. But even with all that, there was so much here that reminded me of my own upbringing, of the truths we held to be true at the time, of the way my country developed and shifted and changed shape in those years and how we shaped who we were under that umbrella. There are some terrible moments in this book but most of them are mentioned without too much depth. I couldn't decide if that bothered me or not. Likely, I was too busy having my own walk down memory lane and if this weren't a story that hit so close to home, I would have wanted more depth. My biggest beef with this story ended up being the ending. I felt like there was so much detail in her story and then when the ending came, it all fell flat for me. I wanted to see how her story evolved as she shifted and evolved. Even if it were some sort of epilogue. I was so invested in her by this point (which says a lot about the graphic novel) that I felt let down. Overall, this story had a personal impact on me so it's very hard for me to gauge if others will love it. But since the original recommendation came from an American, I think others will like it as well. Sign into Goodreads to see if any of your friends have read Dare to Disappoint.